Every generation shares the same fears and uncertainty about the future that the previous generation once had. We may not see it at first, but there’s really no escaping the fact. It’s a realization we don’t like to face because it means we’ve crossed a line. The line. You know the one…when you start echoing the same things your parents once said. The truth is that we often overlook the worries of the past that we now complain about as if they are brand new. Many of our shared concerns as a society come in cycles, and what was old becomes new again. 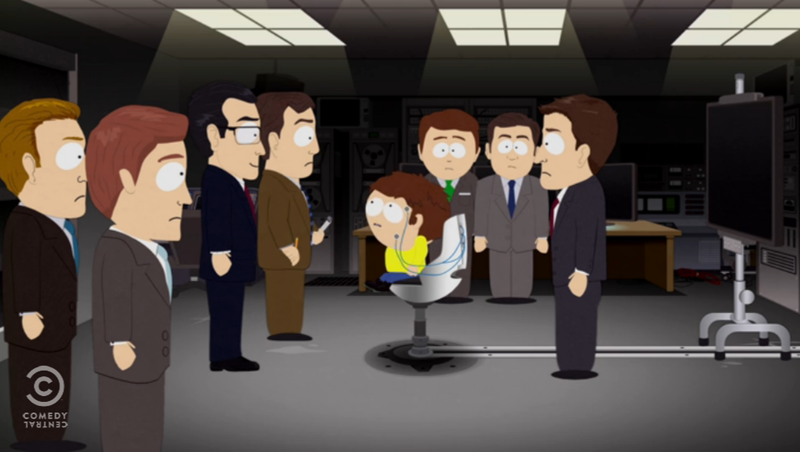 The current season of one of my favorite TV shows South Park has focused on some of these shared concerns from the past that are making a comeback—like political correctness, gentrification, and advertising overload. It’s an odd and intricate mix of themes, but if you’re fan of smart insights and 3rd grade humor, I recommend checking it out. As a marketer, a recent storyline in the show that revolves around the fear of advertising grabbed my attention. 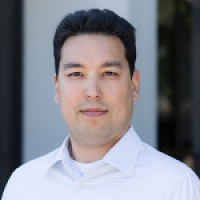 It all centers on the increasing intelligence of ads’ ability to predict what you, as a consumer, will click on or interact with in real life. 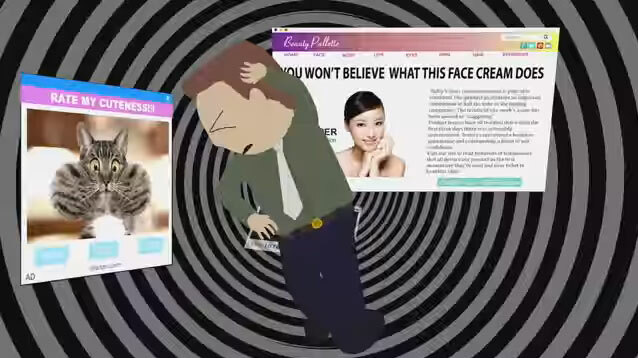 In several scenes, the characters in the show have an almost impossible time accomplishing anything online because they are constantly being distracted by “sponsored content,” which sidetracks them from their initial intentions. While this battle of attention is raging, one of the kids, Jimmy, discovers that there are people in the world who aren’t really people at all…they’re ads! Only Jimmy has the ability to distinguish these walking, talking, artificial intelligence driven ads from real people, which leads to him being kidnapped by a shadowy group of ex-newsmen to help expose the conspiracy. As I said, odd and intricate. It’s a frightening look into a world gone horribly wrong. What led to this new world of mixing advertising with entertainment in all forms? Is it all our grandparents’ fault? Or maybe our great-great-grandparents’? I’m sure it goes back even further than that, but let’s take a look back at the progression of this “new” type of advertising. Back before the internet and television, the radio ruled entertainment at home. Product sponsored shows were invented in this era and popular stars of the day mixed entertainment with advertising in a very early form of sponsored content. Even then, listeners were impatient with commercials, so advertisers experimented with new ways to sell their wares. In fact, soap operas were originally radios shows sponsored by detergent brands to reach the homemaker demographic, but the value of beloved and trusted personalities endorsing products was quickly realized. 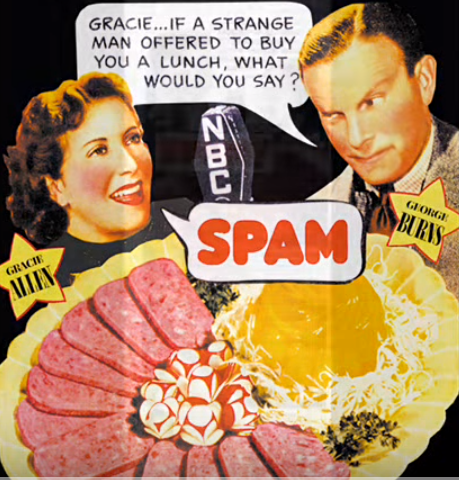 Remember George Burns and Gracie Allen singing the praises of the heavenly canned meat product, SPAM? Recently, I’ve noticed the almost seamless evolution of the old radio concept of sponsored advertising on television. 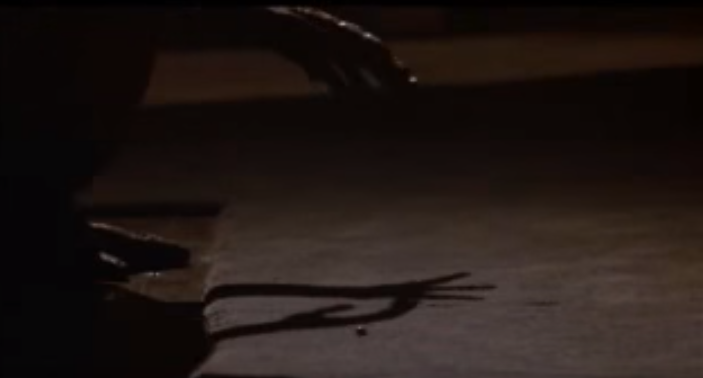 This spot below from the Comedy Central show Drunk History is a great example of this. On this show, comedians will enjoy a few adult beverages and then retell the story of a historical event or person. The advertisement for a new video game below, set in Victorian London, could almost pass unnoticed as a segment of the show. Even if you were fast forwarding through the commercials, you probably wouldn’t skip over this because it features familiar faces from the show you’re watching and is structured in a very similar way. It’s also entertaining enough to keep you interested as it doesn’t focus on the product itself, but more on the experience and the fun the host and guest are having playing it. The fact that this tried and true method of advertising has found a home in the latest form of popular entertainment shouldn’t be a surprise to anybody. It’s just another medium in the continuing endeavor for people to sell their goods, services, and opinions to each another. Like anything else, it takes time to polish and refine the process so that it becomes more valuable than distracting, both from a consumer and marketer perspective. As consumers, we look to the fast forward button and ad blockers to skip over the ads that don’t resonate with us. But as marketers, we continually strive to show relevant ads to those who are most interested in our products or services. As the wheel keeps turning and technology progresses, marketers will get better at targeting our ads to the right audience and these fears of advertising will fade in the past… until the next generation. Have you seen any sponsored content lately that felt seamless? I’d love to see them in the comments below.